The Girl Scouts of Central & Southern NJ offers camp options focused on activities and experiences that will help young girls build courage, confidence and character. Although it is cold and blustery out, parents and children all over New Jersey are already exploring summer camp options. In a time where costs are skyrocketing and everything is becoming more and more expensive, it is comforting to know that girls can still have an affordable and amazing experience this summer at camp offered by the Girl Scouts. If you have ever gone to summer camp you probably have fond memories of sitting around the camp fire roasting marshmallows, singing everywhere you went, making new best friends and spending sunny days underneath the trees. Some things change, but these traditions remain the same. 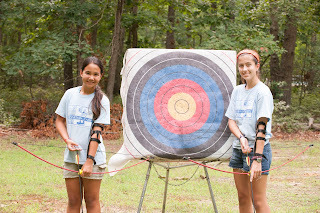 Today’s campers learn how to shoot a bow and arrow, cook over a camp fire, swim in a lake or pool, climb a rock wall, get messy with a science experiment, discover their inner artist and find their voice as they gain the confidence to speak in front of a group. The Girl Scouts of Central & Southern NJ offers camp options focused on activities and experiences that will help them build courage, confidence and character. Girls are given opportunities to try new things that are on the edge of their comfort zone while in a supportive environment. All interested girls in grades K–9 can go to Girl Scout summer camp and have amazing adventures, make lasting friendships and try new things. Campers don’t have to be a current Girl Scout member to register for Girl Scout summer camp. Girls can choose from a variety of different program and camp options; GSCSNJ offers Sacajawea resident camp in Newfield, NJ and two day camps options; Camp Inawendiwin in Medford, NJ or Oak Spring Camp in Somerset, NJ. No matter what program a girl might choose to participate in at summer camp, the core values that girls learn are the same. Girls participate in activities that are designed to push their boundaries and grow as leaders. For more information about Girl Scout summer camp or to register today please visit www.campforgirls.org or look for our camps on Facebook. For more information about the Girl Scouts of Central & Southern NJ, visit www.gscsnj.org.